This resource is suitable for P4-7 and links the following clips from the Scotland on Screen Archive to the topic Rivers and Coasts paying particular attention to their industries. Before watching these clips ask the pupils to make a list of coastal industries and river industries in Scotland. Revisit this list after watching these clips to see if there is anything they might want to add. 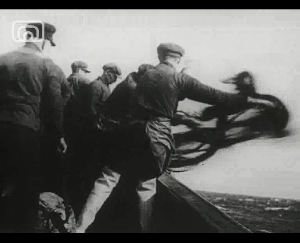 This is a short colour documentary clip with sound, which has been produced by an oil company. It briefly tells how oil and gas are made over time and uses simple diagrams to illustrate the process. 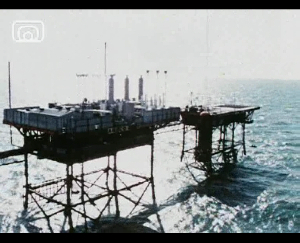 The clip shows the basics of the first oil rigs in the North Sea in 1966. This clip uses music and a voice over. There are a variety of interesting camera shots including some from a helicopter. Why does the voiceover mention “expensive risk to oil companies” and nothing about the profits that the company will make? Is there any reference to environmental issues and why do you think this is? Are there any woman or people of different nationalities in this clip? Do you think the sound was recorded while the film was being shot or added afterwards? (It was added afterwards). Watch the clip again and see if you can find the clues that tell you this. What instructions did the director give to the “scientist” looking at the printout of the ocean floor? You may want to watch this part again. Working in groups, take turns being the director, ask the others to be the actors and give them clear directions of how to do something simple, for instance, you could ask them to walk into a room and sit down. Now choose how you want them to do it, quickly, slowly, maybe feeling bored or happy. Ask them to keep trying until they can do it as you want them to, then ask the rest of the class to guess what your instructions were. Look for and record facts, opinions or statements in the clip that promote the oil industry. Count the camera shots, how many different pieces of music are there? Are there any sound effects? Produce an alternative voiceover to make the film pro - environmental / anti oil industry. Add stills from researched oilrig disasters and spills. Re-edit the clip in Movie Maker as a trailer for an Action movie. Produce an alternative voice over that brings the film up to date. Look at an advert on youtube made for BP oil company and another made for Shell and use ideas from these two adverts to help you. How would this industry effect the nearby coastal areas? Research Aberdeen and surrounding coastal areas. Find how the city has been effected by the oil industry, looking at the airport, heliport, industrial estates, housing, refineries, pipelines, shipping and storage. How has the surrounding coast and its flora and fauna been affected? This clip could be used when studying Science Energy ICT/ number – make a spreadsheet to estimate the cost of making this clip. Think of people who would need to be paid and equipment that would need to be in place. This clip is in black and white with no sound. It is a glimpse of the launch of a new ship from Denny’s Yard on the Clyde, showing three groups of society. The privileged going to watch, the onlookers and the sailors at work on board. Shipyards were an important part of coastal society bringing work and income to Scotland. How can you tell who are the wealthy/important people here. How do they differ from the onlookers? Why do you think the film shows the flag flying on the new ship? Where do you think this film is set? Look at the clip and count how many edits there are. Do you think this has been filmed on one camera? Try planning a voice over for this clip. What name would you choose for this boat? Do you think a man or woman should read the voiceover? What kind of music would you add to this film? In contrast Seawards the Great Ships - Scottish Oscar Winning Film shows ships being launched using sound to great effect. Look at the differences between the two pieces and notice how this film effectively conveys success and mass production using image and sound. 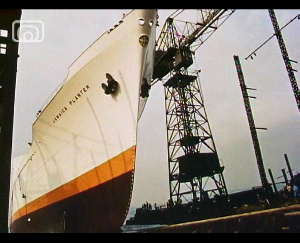 Research where the shipyards in Scotland were and whether any of these shipyards are still producing boats today. Design and technology Design your own ship. How will it be powered? What is it designed for? What materials will it be made from? Grierson shows us images of boats, both broken and functioning. The camera looks closely at broken wooden spines panning around decaying shells. 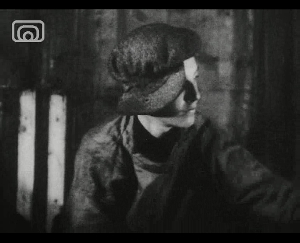 In contrast the film shows us bold metal hulls studded with rivets from different countries. 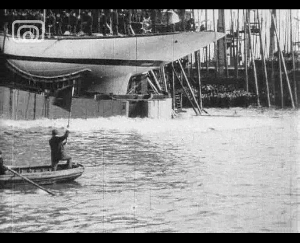 Write a poem using adjectives or similes to convey the two contrasting sorts of boats shown in the first part of the clip. In groups, think about how you could convey Britishness as “splendid”. Plan a talk one or two minutes long to present to the rest of the class. Choose who will present it, who will take notes and who will write the notes up. Practise your talk before you present it and give your presenter helpful feedback on ways to improve your presentation. The fishing industry has been a huge part of Scottish coastal and river culture. How has it changed over the years. Where are Scottish fishing boats going out from now? Which are the main Scottish fishing rivers and who owns these? Who can fish there? Find out how much would it cost for a day’s fishing on three of Scotland’s rivers. What would it cost to rent a cottage or hire rooms? How much would you need to spend on an evening meal? Produce a brochure advertising fishing holidays on a Scottish river with accommodation and meals in a local hotel. Look at different fishing rods and fishing flies and discuss their functions. Try drawing fishing flies in an art class. Look at different fishing nets and methods of sea fishing. Do you think this film was shot in sequence? What are your reasons for your answer? Notice how the weather changes, how the men are dressed, how the light in the sky changes from shot to shot. Do you think the filmmaker filmed the whale and the underwater shot of swimming fish while he was on the fishing boat filming the fishermen? What is the reason for your answer? Why do you think Grierson added the birds and the whale to his film? Look at the “Drifters” film again and notice how many ways the empty net is filmed. Look for close up and long shots. Look for shots from different angles. Imagine that you are from the Health and Safety department of the fishing industry. What things do you think would need to be changed to meet present day safety requirements? Design a board game based on river and coastal industries. Look at board games you and your classmates like and discuss why you like them. Plan your game, choose a name, make the board and the pieces and swap your game with other groups for them to try. Was your game successful? Do you need to make any changes? Was it fun to play and to make? 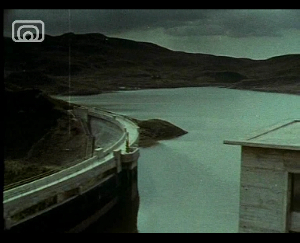 The clip from this film, narrated by John Grierson, tells the story of a project to make Hydro Electricity at Loch Sloy in 1946. The clip begins with a voice over and images of water collecting in Scottish streams, rivers and drains. We are told of the Sloy dam project, a massive engineering task to link water sources together by tunnelling through mountains to make one vast water supply. The Sloy dam was completed in October 1950 and Hydro Electricity was produced to fuel industry on the Clyde. Watch this clip a second time and this time pay particular attention to the cuts. They are very easy to spot. Watch up to the shot of the house roof and stop the film. How many cuts or clips did you count? Look at a map of Scotland and identify the water reservoirs and power stations. These sites will help you. This clip could be used in studying Science - Energy. How is Hydro Electricity produced? Design and Technology - Pupils could make a waterwheel and see how water from a tap or hose forces the wheel to turn. You could find instructions for a waterwheel or pupils may want to design their own waterwheel. This lesson guide was prepared by primary school teacher Marion Normand.